When ordering a new Coat, Jumper or Collar for your Whippet, Lurcher, Greyhound or Italian Greyhound you can not just go purely on the sizes shown on the description. It is very important that you measure your Sighthound first! 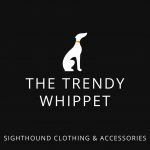 Here at The Trendy Whippet, we thought it would be useful to supply a ‘Measuring Guide’ Video to show you how and where to measure. Below is also a simple picture to show you how to measure. Or follow the link below to our YouTube page for the video guide.